If the Runner trashes Illegal Arms Factory while it is installed, take 1 bad publicity. When your turn begins, gain 1credit and draw 1 card. 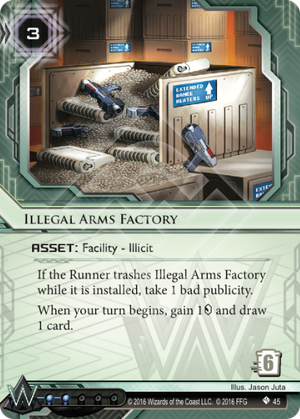 Does the Corp take a bad publicity if the Runner trashes an unrezzed Illegal Arms Factory? No. The ability is not active if Illegal Arms Factory is not active. The phrase "while it is installed" is just a reminder and does not functionally change the ability. This card alone restored my netrunner-libido and brought almost forgotten sweet sensations from my noobish days, when I suddenly discovered supermodernism. Just rez couple of those heater factories and enjoy ride of your life. Master this force of nature, ride cyclopic tsunami of unconditional clickless draw and if you're worthy of such magnificent power, no filthy Runner will keep up with you. Works best with versalite tempo cards which can be casually thrown around. Usually needs some protection, be it defensive upgrades or ICE. If Runner insists on trashing, it's still quite expensive — don't be ashamed to capitalize on inflicted tempo hit. And if you ever feel this wonderful magical pot of draw should stop cooking, just override it with install — no BP involved. This, Lynn and Hunter Seeker feel like Weyland Core set (or follow up cycle) cards which got delayed for years due to some silly mistake. That's how W should be — go fast and break intruders. While selling firearms to children, of course. Post-rotation/Core 2.0 this card got much better. We've been spoiled with the card draw engine of Jackson Howard for a long time. There are far fewer options for card draw now. This one also happens to get you money and has a very high trash cost. The only other good card draw engine at the moment is the HB clearance suite, but that's a lot clunkier if you're not playing HB, or more specifically Cerebral Imaging: Infinite Frontiers. You're much more likely to draw more than you can use with the latter two clearances, and the first doesn't really help overdraw. With Illegal Arms Factory, the cards drip in slowly. On top of that, the clearances cost more influence outside of HB. If you're trying to go fast, this can be a great engine to keep you going. If the runner decides to trash it, you probably come out ahead - it replaced itself and net cost you at most 2, while costing the runner 6 plus anything it cost to get in the server. However, a brutal counter to this card is Imp. It completely ignores the high trash cost yet nets the runner the coveted Bad Publicity. So, pay attention to your meta. It's like a more expensive pad campaign mixed with Laramy Fisk that gives you bad publicity, in exchange for + 2 trash cost. You put in in your deck if you are a masochist, and you don't want to influence in anonymous tip.